Searching for Authentic Mexican Food for a Great Price? 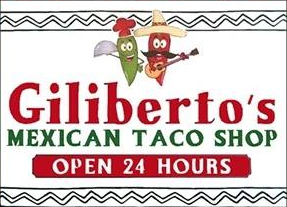 Giliberto's Mexican Taco Shop serves authentic Mexican food, and all of our dishes are made fresh. From scratch-made enchiladas to delicious tamales, there's something on our menu to satisfy any craving. Don't forget to stick around for dessert! We serve all of your favorites, including fried ice cream and fried cheesecake. Have a hankering for Mexican food late at night? We're open late, and some of our locations are open 24 hours. Stop by our Mexican restaurant in Moab, UT, Saint Cloud, MN or Sioux Falls, SD today. Check out the wide selection of authentic Mexican favorites on our breakfast, lunch and dinner menus. Craving Mexican food? Find one of our convenient taco shop locations near you. All of our menu items are made to order with fresh ingredients. You heard us right: you can get a delicious breakfast burrito or slider at our Mexican restaurant any time of the day. You'll find a warm, welcoming environment for the whole family when you visit our taco shop.